Ramen Riders Round #2! The idea is simple, get some motorcycle riders together, ride to a rad ramen shop that is inaccessible by train, then tour for the rest of the day. The last time was up north to Ibaraki, this time was east into Chiba. The destination, not only a ramen shop, but a popular biker hangout. 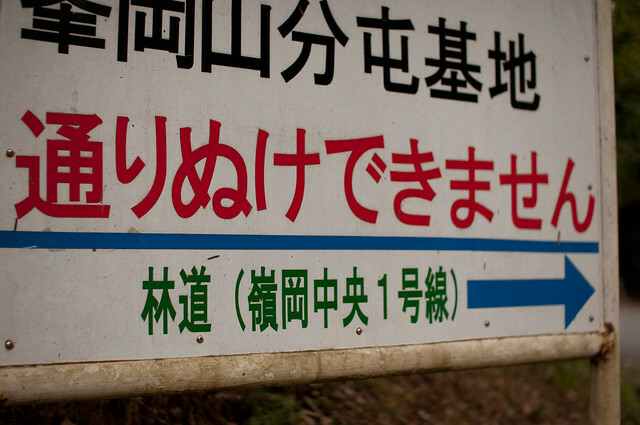 If you ever see these kanji characters (minus the や), watch your step. More on explosive landmines in a minute. Jiraiya is a Harley friendly mecca in eastern Chiba. Signs threatening destruction of all other maker's bikes had us parking our Hondas and Kawasakis off to the side of the shop, just as a tough looking gang of Desperados were making their noisy exit. Actually, I've never met a "tough" Harley rider in Japan, and dreams of being the next member of the Sons of Anarchy are trumped by weekend warriors out to relive Easy Rider. Rider approved ramen. The shop offers a wide arrange of Chinese inspired eats, from standard bowls of noodles, to steamed dumplings, to a バイカーズセト. Get the biker's set and you'll be napping on the nearby beach from a food coma in no time. Homemade hot oil piqued the interests of our group, and the only choice was to order the super spiced hotpot ramen. Here is the aforementioned landmine. 14 secret spices, and a shoyu soup made with local fish, all bubbling up in front of you. The initial sip of soup resulted in a flame induced gasp for air, which quickly gave way to the underlying flavors. Even though this bowl looks like it could do landmine-power destruction to your palate, the pain doesn't linger. It is unknown what the effects of actually eating the red peppers would accomplish though, diner beware. The flame lit directly under the iron pot means that the noodles are much too hot for direct slurping. Be quick about the noodles, as the constant heat makes them a bit on the soft side. If you are a biker in Japan, check out www.gaijinriders.com or www.sbkjapan.com, the two forums that I use to post on. Riders of all abilities welcome! Owner of Jiraiya and President of the Zero One Harley Davidson Motorcycle Club. 伍代目庄右衛門 is a great guy. Godaime Shoemon is heavy into the HD scene. If you too are into that scene, hit up his annual New Years countdown party at the shop. He promised plenty of booze and a killer sunrise over the Pacific Ocean from the nearby beach. He insisted on fixing my broken turn signal, even though I insisted that it was a lost cause. An hour later, and it was broken again. I'm sorry, I just can't force feed myself truck stop ramen, even if it is for the sake of my ramen adventure. Nor did I have any space on the bike for ramen gift packs. The forest road is good fun, though high speeds are a bit risky on the overgrown, single-lane route. It dumps you off at another expressway, which you can take home. I will be planning more of these rides in the future. Once a month is the goal. Some will be as simple as a late night ride up to Saitama. Some will be multi-day camping trips into Northern Japan. Keep watch on the above mentioned motorcycle forums or at the Ramen Adventure Facebook page for details.